Jared Unzipped: Nintendo Reveals A Brand New Pokémon -- Magearna! The news broke late yesterday that Nintendo has revealed a brand new, never before seen Pokémon. This is Magearna. It will premiere in the next Pokémon movie, which will be released later in 2016. Nintendo provided no further information about this mythical legendary, which they refer to as the Artificial Pokémon. There's also no details about how players will be able to acquire Magearna in game, but that leads to a great deal of speculation. Will Magearna be part of a new seventh generation of games? Or, will it be part of the long-rumored Pokémon Z? There's simply no way of knowing, so we'll all have to wait patiently and find out. 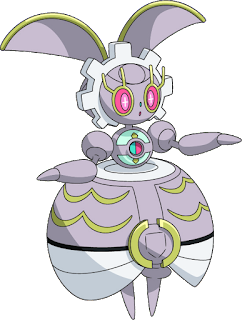 Just based upon the design, I would assume Magearna would be a Steel or Fairy type, or a combination of the two. As more news develops, I'll provide it here.